Traveling to the South of Spain is a true step into the past, and it’s exhilarating to see the modern city of today laced with the historic monuments of the past. There are some truly memorable monuments in Granada that give you a peek into the city’s history and invite you to learn more about how Granada came to be the city it is today. 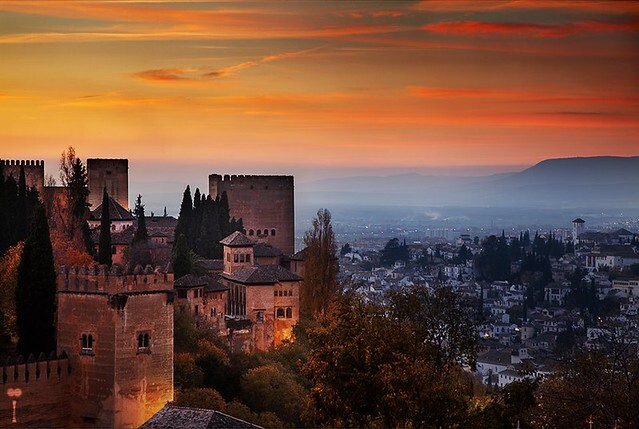 The first and arguably most important monument in Granada is the Alhambra, the majestic Arab fortress and castle that sits high upon a hill overlooking the city. This amazing monument is definitely worth some time, as you’ll want hours to appreciate the stunning architecture and beautiful gardens. Let yourself get lost in history as you walk through the tile-laden rooms and keyhole arches and think about a very different time period in Granada. The next must-see monument in Granada is the beautiful Catedral de Granada, which is right in the center of the city. The cathedral was supposed to be Gothic-style, and that’s the way it started. But five years into the process, there was a change in architect and a change in mentality, and it become a Renaissance-style church thereafter. It’s also right by the Capilla Real, which is another monument in Granada worth seeing and the burial place of the Spanish monarchs Isabel and Ferdinand. Another monument in Granada that is worth seeing, and that is as much of a whisper to the past as the Alhambra, is the historic Bañuelo, a beautifully preserved Arab bath from the 11th century. It is located along one of the most picturesque streets of Granada, the Carrera del Darro, and you can access this amazing piece of history through a little door of a private house. Take a step into the past with these well-preserved and beautifully ornate Arab baths. Granada’s Plaza Nueva is its oldest square, and an ideal place to visit while in the city because it offers a little glimpse into a Granada from the past. Here you’ll be able to enjoy people watching while sipping a drink outside and later walk up the hill that leads to the historic Alhambra. Its central location makes it an easy stop during your time in Granada, and one that leads to many other points of interest within the city. Let us help you discover these monuments in Granada and so much more. With Andalucía Inside, you'll get a true insider's look into the South of Spain and experience Andalucía like very few really do.